Registration continues for the NFMA's 36th Annual Conference to take place at the Belmond Charleston Place Hotel, Charleston, South Carolina, May 7-10, 2019. To view the program, click here. To register, click here. To see who is speaking, click here. Our Diamond Plus and Diamond sponsors are listed here. To view exhibitors, click here. The NFMA is disappointed that the U.S. Appeals Court affirmed U.S. District Court Judge Swain’s decision allowing for Puerto Rico’s Highway and Transportation Authority to withhold bond payments backed from pledged tolls and other revenues during bankruptcy. As we stated in the amicus brief that we filed on May 16, 2018 (click here for Amicus Brief), revenue bonds are a critical source of financing for infrastructure projects and it has been an underlying premise and expectation of the municipal market that timely payment of debt service on special revenue bonds would be honored in all circumstances, including Chapter 9 bankruptcy. Judge Swain’s Assured Guaranty decision, and the recent affirmation by the Appeals Court, is at odds with prior court decisions and legislative history and is likely to result in negative market implications for revenue bonds throughout the municipal market. The Municipal Analysts Bulletin, Vol. 29, No. 1, is available by clicking here. The NFMA publishes its newsletter three times per year. The newsletter provides members with the opportunity to hear from NFMA officers and committees, as well as constituent societies, with news about past and upcoming initiatives and events. You can find past newsletters under Resources on the navigation bar on the NFMA home page. The NFMA Summary of the SEC Rule 15c2-12 Amendments issued on August 20, 2018 is available online. To read/download the summary, click here. The NFMA holds an Annual Conference each spring. The conference provides members with the opportunity to hear presentations, to meet with members of other Constituent Societies of the NFMA, and to contribute their efforts to the overall advancement of the NFMA. 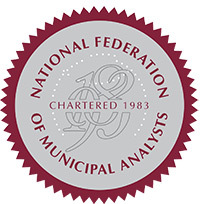 At the conference, the NFMA presents awards to individuals and organizations for extraordinary contributions to municipal analysis. For a list of past award recipients, click here. The NFMA also holds its Introduction to Municipal Bond Credit Analysis for new analysts each fall; the location for the past several years has been Philadelphia. Finally, Advanced Seminars cover in-depth current topics of importance to the industry for seasoned analysts, and are held in various locations around the country each fall and January. Constituent Societies hold educational events for members. Many of these events are open to members of other societies within the NFMA, and are posted on the NFMA's Event Calendar. The NFMA has been a strong advocate of improved disclosure in the municipal market since its inception. Throughout its history, the NFMA has issued recommended best practices, white papers, comment letters and position statements on relevant topics in the municipal market. To view NFMA papers, go to Resources.